Photographer Salvador Espinoza spent months riding the bus to Rikers Island. EAST ELMHURST — Growing up in Long Island City, Salvador Espinoza would sometimes see the Q100 bus drop off inmates at Queens Plaza, usually in the early-morning hours. Recently he noticed a different set of passengers as he traveled to work in the middle of the day. Espinoza, 35, became fascinated with the bus, which travels from Queens Plaza through Astoria and East Elmhurst before eventually ending up at the Department of Correction facility. 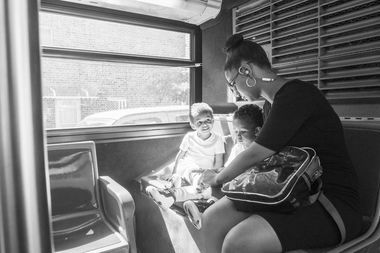 He began riding the bus six months ago as he scouted out his photo project, “Q100,” which will debut Dec. 10 with an opening party at QNS Collective in Long Island City. The project received funds from the Queens Council on the Arts, and will also feature a performance by poet Miles Hodges, who teaches at Rikers Island. The photos bring up questions about mass incarceration, he said, and the effects that go far beyond the individual inmate. “What is it to have someone incarcerated, and how does that affect people?” he asked. Espinoza would sometimes take two or three rides out to Rikers in a day before going to work as a pawn broker in Brooklyn, he said. He took limited photos on the island, before he said security became more strict during the last few months of his project. He mainly focused on the people riding the the Q100, who each had their own stories of who they were visiting. The stories he heard were compelling and heartbreaking, he said. The one that stood out the most was of a Bronx woman who took a three-hour ride on public transportation to visit her 19-year-old son who has been at Rikers for three years. Just months before she had received a kidney transplant, and required multiple medications that she had to leave inside the visitors locker area before going through a series of metal detectors and security checkpoints to visit her son, he said. “She goes to see her son for about five minutes just to drop off underwear,” he said. He doesn’t get many visitors, she told him, and it was important for her to come by as soon as she could. “That kind of speaks to what some people have to go through,” Espinoza said.